This article is the first step towards an understanding of how kHTTPd can take the role of a web server while never leaving kernel space. One of the most renown features of Unix is the clear distinction between ``kernel space'' and ``user space''. System calls have always been the means through which user space programs can access kernel services. The Linux kernel implementation allows to break this clean distinction by allowing kernel code to invoke some of the system calls. This leverages the kernel's capabilities to include some of the tasks that have traditionally been reserved to user space. To keep the discussion simple, throughout the article I'll refer to the PC platform and to x86 processor features, disregarding for a while any cross-platform issues. While I write this article, the official kernel is version 2.4.0-test8 and that is what I refer to in both the discussion and the code. Sample code is available as ksyscall.tar.gz from here. Please note that invoking system calls from kernel space is not in general a good thing. To the sake of maintaining, debugging and porting the code, what has always been performed in user space should not be converted to run in kernel space, unless that is absolutely necessary to meet performance or size requirements. The gain in performance comes for avoidance of costly user-space/kernel-space transitions and associated data passing; the gain in size comes from avoidance of a separate executable with its libc and associated material. In order to understand the speed benefits achieved by invoking system calls from kernel space, we should first analyze the exact steps performed by a normal system call, like read. The function's role is copying data from a source, (usually a device, either a mass-storage or a communication medium) to buffers held in the application. Figure 1 shows the steps involved in performing a call to read from a user space function, like the main procedure of a C program. You can verify the exact steps by running objdump on compiled code for the user-space part and browsing kernel source files for the kernel-space part. A system call is implemented by a ``software interrupt'' that transfers control to kernel code; in Linux/i386 this is ``interrupt 0x80''. The specific system call being invoked is stored in the EAX register, abd its arguments are held in the other processor registers. In our example, the number associated to read is __NR_read, defined in <asm/unistd.h>. After the switch to kernel mode, the processor must save all of its registers and dispatch execution to the proper kernel function, after checking whether EAX is out of range. The system call we are looking at is implemented in the sys_read function, and it must (like several other system call) dispatch execution to a file object. The file object itself must first be looked up based on the file descriptor that the user application passed to the system call. The read method for the file object finally performs the data transfer and all the previous steps are unwound up to the calling user function. Each arrow in the figure represents a jump in CPU instruction flow, and each jump may require flushing the prefetch queue and possibly a ``cache miss'' event. Transitions between user and kernel space are especially important, as they are the most expensive in processing time and prefetch behavior. To add real-world figures to the theoretical discussion, let's look at the exact time lapse needed by an empty read system call to execute. An empty call is one that transfers no data at all. We'll invoke it on the stdin file descriptor, 0, because stdin is always opened for reading. Moreover, it can be easily redirected to check for differences according to what file is being read. In order to measure time lapses we can use the ``timestamp counter'' processor register. The counter, available on all kinds of Pentium processors is a 64 bit register that gets incremented at each clock tick. To read the counter a program can invoke the rdtsc assembly instruction. After including <asm/msr.h>, (named after "machine specific registers"), C code can call readtsc(low,high) to retrieve the 64 bit counter into two 32 bit variables, orreadtscl(low) to retrieve only the lower half of the counter. We'll use the latter form, as we'll just need subtract two values, an operation immune to 32-bit overflow if the measured difference is less than 32 bits in size. Listing 1, part of the usystime.c sample file, can be used to measure the number of clock ticks the processor takes to execute a read call. The code tries several times and only the best figure is considered because process execution can be interrupted or delayed because of processor scheduling, extra cache misses or other unexpected events. Running the code on my 500MHz box reports a count of 11 ticks for the rdtsc instruction, and 474 ticks for the empty system call. It corresponds to aboout 0.95 microseconds. The same code executed on a different processor takes 578 ticks (and 32 for reading the timestamp). Let's now consider issuing the same read system call from kernel space. The easiest way to accomplish the task is exploiting the definition of read and several other system calls that <asm/unistd.h> exports if [cw]KERNEL_SYSCALLS[/] is defined. Therefore, sample code declares the macro before including any header. Before calling the function, however, a preparing step must be performed. Like any other function that transfers data to/from user space using a user-provided pointer, the system call checks whether the provided buffer is a valid address or not. During normal operation, an address that lies in the user address range (0-3GB for standard kernel configuration) is considered valid, and an address that lies in kernel address space (3GB-4GB) is not. If the system call is invoked from kernel space, though, we must prevent the usual check to fail, because the virtual address of our destination buffer will be in kernel space, above the 3GB mark. The field addr_limit in the task_struct structure is used to define the highest virtual address that is to be considered valid; the macros get_fs and set_fs can be used to read and write the value. The limit that must be used when invoking system calls from kernel space (in practice, the "no limit" case) is returned by the get_ds macro. See the box in this page for an explanation of the names and meanings of the macro calls. There's no need to wrap each individual system call, and group of them can occur in a row. It's important, however, that the original ``fs'' is restored before returning to user space. Otherwise, the user program that executed this code will retain permission to overwrite kernel memory by passing bogus pointers to further read (or ioctl) system calls. Once equipped with these ``grossly misnamed'' tools, we can measure the performance of a system call invoked from kernel space. The code shown in listing 3 is part of the ksystime.c source; it can be compiled into a module that executes the code in kernel space (in init_module) and then exits. Since the initialization of the module returns a failure indication, you can re-load the module to run the measure once again without the need to unload it in advance. The code executed in kernel space reports 11 ticks for rdtsc (the same reported in user space, as expected) and 424 ticks for the empty system call. The savings is 50 ticks. Once upon a time, when Linus was playing with his new 386 PC and Linux wasn't even there, Linus said "Intel gave us the segments, let's use the segments". And he used the segments. A ``segment register'', in i386 protected mode, acts mainly as an index into a table of ``virtual-address descriptors'', the ``descriptor table''. And each memory access uses one of CS (code segment, default for code fetch), DS (data segment, default for data access), ES, FS (extra segments, useable for data access) as its virtual-address space descriptor. The first implementation of the kernel-space memory map used virtual addresses that mapped one-to-one to physical addresses. The user-space memory map on the other hand was dictated by the binary formats in use for executable files, and all of them use low virtual addresses for executable and data pages. Therefore, executing system calls required switching to a completely different memory map than the one of user space, and this was accomplished by using different descriptors for the memory map associated to the code and data segment in charge in user-space and kernel-space. Since several system calls need to access the user address space, the FS register was reserved to hold the user memory map while in kernel space. get_fs returns the current segment descriptor stored in FS. get_ds returns the segment descriptor associated to kernel space, currently stored in DS. set_fs stores a descriptor into FS, so it will be used for data transfer instructions. This layout of virtual memory and segment descriptors remained in use up to version 2.0 of the kernel, included. The first great innovation brought in by version 2.1 was the switch to a different approach, consistent to what other platforms were already doing. The user and the kernel descriptors now share the lower 3GB of the virtual address space, and life is both easier and more performant. The FS segment register has been put to rest and user memory is now accessed by the DS register, just like kernel memory. FS only survives in the names of a few preprocessor macros. You may object that the savings measured, 10%, is not as large as one may expect. Actually, a quick look at the definition of the macro (in the header) or at disassembled object code shows that the implementation of read as defined in <asm/unistd.h> still calls interrupt 0x80. The kernel implementation of the system call is not optimized for speed, and is only there for the convenience of a few kernel needs. It's interesting to note how code for some Linux platforms invokes kernel system calls by directly jumping to the sys_read (or equivalent) function, thus skipping the workload associated to the third column of figure 1. This is not currently possible with the PC platform, unless you do nasty hacks; with those hacks in place (shown and explained in the code but not worth showing here) the call takes 216 ticks,, 54% less than the user-space case. But if you are really interested to get the best performance out of your kernel system calls, the thing to do is directly invoke the read file method, after retrieving a pointer to the file structure represented by the file descriptor (0 for stdin). This approach to system calls invocation from kernel space is the one used the kHTTPd, as it is the fastest possible: the processor will only incur in the workload associated with the last column of figure 1, i.e. only the actual data transfer operation. Listing 4 shows the code that implements this technique in the sample module ksystime.c. The set_fs and associated calls are not shown as they are the same as above). The execution time of this code is reported as 175 clock ticks, 63% (or 0.6 microseconds) less than the user space case. You may even try to cache the two pointers being used in the call (f_op->read and &file->f_pos), this is reported in the sample code as well. Unfortunately it makes no real difference and in some cases it can even make execution slower because of the inappropriate small size of the PC register set. Up to now we have collected a few figures, and found that making system calls from kernel space can significantly reduce the overhead of the system call mechanism. It's high time, in my opinion, to step back for a while and ponder over the figures we collected. How could we still incur in 175 clock ticks of overhead associated to the read system call? The answer is in looking at the read file operation we are using: the insmod program, whose standard input is being used, is connected to a tty (specifically, a pseudo tty controlled by xterm in this case). If the standard input of the test program is connected to a different kind of file we get completely different figures. Reading a disk file for example is much faster (but it still depends on the underlying filesystem), and reading /dev/null has almost no overhead (7 clock ticks, but the read method of the file just return end-of-file). The numbers collected will also vary across processor vendor and stepping, thus making all benchmarks almost pointless. As usual. Figure 2 shows the times I collected on my PC, to give an idea of the great difference in the various read file operations. It shows that my CPU has an overhead of 50 ticks (0.1usec) in crossing the user/kernel threshold twice, it also spends 210 ticks (0.4usec) in processing generic system call entry/exit and 40-75 ticks in sys_read. Since actual data transfer takes two or three clock ticks per byte (measured by copying a 64-byte buffer in the read calls), the overhead that can be avoided by using kernel system calls is worth a data transfer of 100-150 bytes. This is a non-trivial figure if performance is your main concern and you transfer small data packets. On the other hand, it may well not be worth the effort for most of the applications. 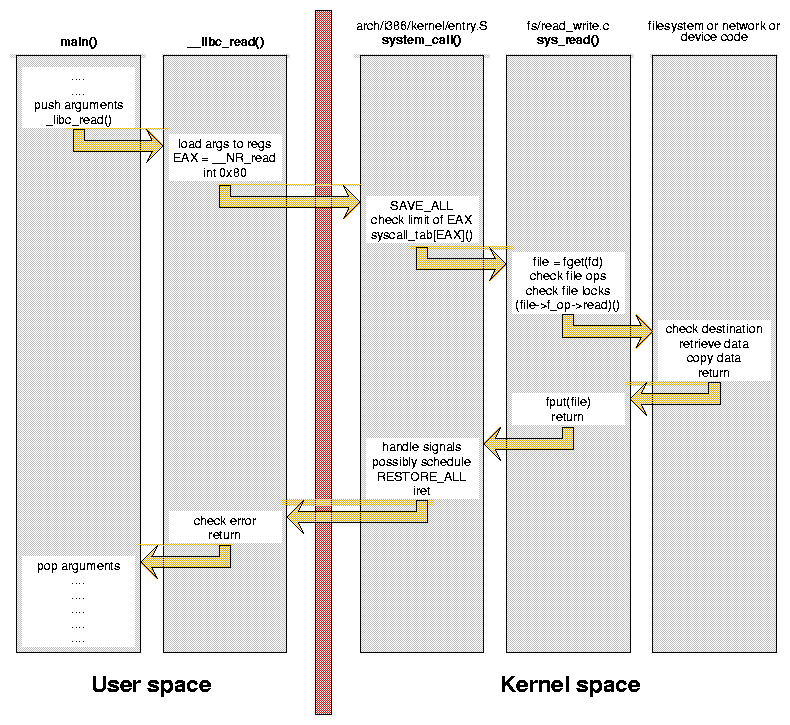 While kernel-space system calls are an interesting tool, and playing with them can teach a lot about kernel internals, I still think their use should be as limited as possible. For example, a device driver shouldn't read a configuration file using kernel-space system calls; reading a file involves error manamegent and parsing of file contents -- not something suited for kernel code. The best way to feed data to device drivers is through ioctl via a user-space application. This column showed how kernel system calls work in order to lay the foundations for a discussion of the kHTTPd implementation, that will follow the next month. Alessandro is an independent consultant based in Italy. He runs Linux kernels on 9 different computer platforms and part of his activity is sponsored by linuxcare.it. He can be reached as rubini@gnu.org.